(BPT) - Nearly one in six of all U.S. children and adolescents are obese, according to the U.S. Center for Disease Control. And with some struggling schools forgoing traditional physical education classes, health experts view this issue as a growing concern. The regular physical activity encouraged in PE classes not only helps build and maintain healthy bones and muscle, it has also been shown to improve students’ academic performance. 1. Set measurable short term goals. Motivation is all about goal setting. Teaching your kids or students to evaluate their habits and make changes that will improve their well being helps them learn the importance of living a healthy lifestyle. Setting goals can be a fun project that teachers, parents and students can work on collaboratively, just be sure the goals are measurable, timely and realistically achievable. 2. Use technology to help them understand. For students to excel athletically, they need to understand the “how,” “why” and “feel” behind the skill in their activity. If a child gets involved in a sport simply because their parents pushed them to, they likely won’t be motivated to improve or continue playing. It’s important to help your kids find activities that boost their self-esteem. 4. Be a model for active behaviors. Show your kids how important staying active is by setting a good example. Younger children tend to follow the lead of their parents, so make sure you’re looking after your own health. Make the physical health of your entire family a priority. 5. Get involved in group activities. Kids are more likely to be motivated when they receive support from a group of peers. Whether it’s a sports or dance team, running club or an active play date, encourage your kids to get out and be active with their friends. 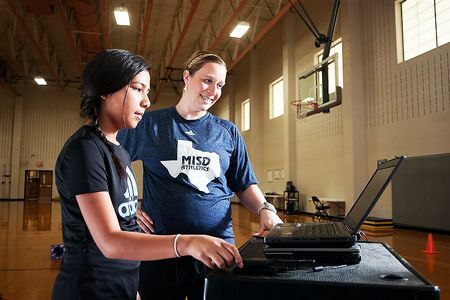 While rising obesity rates and dwindling physical education classes continue to be a concern, the right approach and resources can help teachers and parents take matters into their own hands. Tools like the IHT Spirit System are certainly a big step forward, and following these tips can also play a part in helping every child get their health on track. For more information and resources visit ihtusa.com/zone.